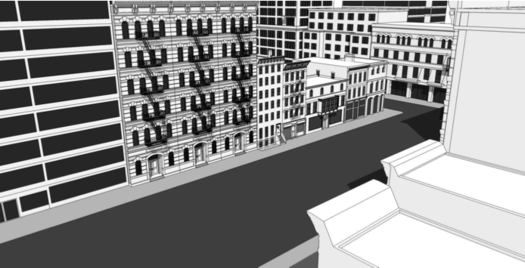 A concept drawing from the part of the draft detailing the rules for a mixed-use downtown district: "The purpose of the MU-DT district is to provide for a wide range of uses and encourage infill redevelopment while reinforcing existing, well-defined urban character of Albanyâ€™s historic downtown area." The Rezone Albany process has been going on for almost two years now, and it's the sort of thing that might be easy to just be like, "Zoning? More like zzzzzzzzzzzzzzzonig, amirite?!" But the issues up for discussion are all the sorts of things that people regularly get fired up about: What sorts of buildings are built, complications that keep rundown properties from being redeveloped, what projects look like, what people are allowed to do with properties, and everyone's favorite topic, parking. Given that the city's zoning hasn't gotten an overhaul since the 1960s, there's plenty to update in order to make the code more in line with the direction the city wants to go, and along the way make the rules more clear, consistent, and predictable. Here's a short, quick example of how the Rezone Albany process has already made a difference. People have been looking at the Warehouse District for years has a place that has the potential to evolve into a neighborhood that includes new uses such as residential, restaurants, and retail. But the zoning put a number of hurdles for developers looking to convert old (often unoccupied) warehouse and industrial space into these new uses. So one of the components of the Rezone Albany project was a new mixed-use overlay district for the neighborhood -- and that helped smooth the way for projects such as the planned residential conversion of the old liquor warehouse at 960 Broadway. So, if you're if curious about what Rezone Albany means for the city -- or even just your neighborhood -- these meetings are chance to hear from the people directly involved and to ask questions.